Newsletters - FL Studio 9 - UPDATED! is now UPDATED to v. 9.03! Find out about the additions & bugfixes here. (promotional) price of that product is deducted. Deadmau5 is one of the creators of the Xfer sample pack which contains a plethora of WAV loops and one-shots, ready to be loaded in FL Studio. Find out more about it here. Find out more info & download free demo loops here. for them to stop pirating. 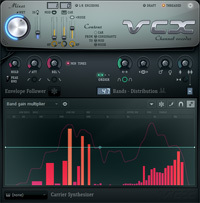 Image Line Software is proud to announce Vocodex VST. It supports voice doubling and reverb capabilities, built-in Soundgoodizer for limiting and warm output, up to 100 bands individually locatable anywhere in the spectrum and many more. Vocoders are the classic robot voices known from the sci-fi movies. So if a human voice is used to vocode a synthesizer chord, it will sound like the synthesizer is talking.